Do you want to get into climbing? Great decision, maybe one of the best decisions of your life! Wondering why? Well, it is because the best view comes after the hardest climb! If you want to watch the best sunset or sunrise in solitude, top of the mountain is the place, period. I can still imagine my first success. Top of the hill, me and the nature with its soothing background music! Aha, that particular scene still gives me Goosebumps. If you want to experience something like that, welcome to the climbing universe! Together, we will make history; together, we will rock and roll on top of the mountain. But to achieve something special, proper preparation is mandatory. You need to know the basics of mountain climbing and also develop your skill too. And then you have to think about the appropriate equipment and clothing. Without proper equipment and clothing, your journey will be devastating. Today in this article I will discuss some of the best climbing shirts. Later on, I will also discuss other essential clothing and equipment needed for climbing. I will make complete your climbing preparation gradually. But for now, let me tell you the reviews of climbing shirts. When it comes to proper climbing clothes, a shirt is a must-have thing. A good climbing shirt will make your climbing journey easier. Fortunately the market has a wide verity of options, and unfortunately, most of those are a piece of shits! Picking good climbing shirt is like searching a needle in the haystack. If you don’t have enough knowledge, you might end up with something useless. So, you have to research more for a better quality climbing shirt which is time-consuming. Most of the people visit the market and pick one randomly. 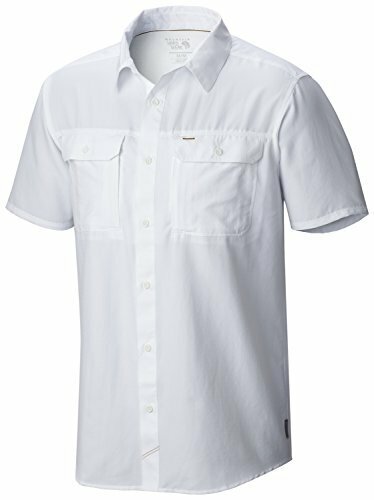 This Mountain Hardwear Men’s Canyon Short Sleeve Shirt will give you that feeling as you are not wearing anything! True indeed! The shirt is thin and light. You will get the ultimate comfort you always desire off. It is an ideal casual or formal wear. The design of the shirt is fantastic with short sleeves and collar. You will get classic fit as well. The shirt is designed with all over print and button down closure. So, you will look stylish out there too. With lots of color options, Outdoor Research Men’s Ignitor S/S Tee is the second entry on our reviews. This shirt will give you everything you need from an outdoor outfit. As I said, you can choose your favorite color from a wide variety of color options. It is made with complete polyester materials. So, the shirt is breathable, lightweight and dries quickly. It is a versatile tee ideal not only for climbing but also for any other adventure. You will even get a small hem pocket. This is wicking and odor proof shirt. The design is classic, and it fits perfectly. If you love this shirt, hurry up to pick your favorite color. The shirt is famous, so there is a fair chance of stock turned out! Don’t take that risk. Click the link below and enjoy your next adventure. Adidas Outdoor Men’s Hiking Reachout Fleece Pullover is another excellent addition for any climbing. It is a unique shirt with fantastic quality craftsmanship. It is made of premium quality polyester material. So, the shirt is breathable, lightweight and dries quickly. That’s the reason it is one of the most practical choices for outdoor adventures. You will get an adjustable waist with drawcords that will ensure proper fitting. The shirt will keep you warm in cold weather condition. It is weather resistant, durable and soft to touch. The design is attractive as well. It features flatlock seams that optimize comfort. Overall, it is an excellent choice for the price. Hurry up and ensure your deal. The stock is limited. 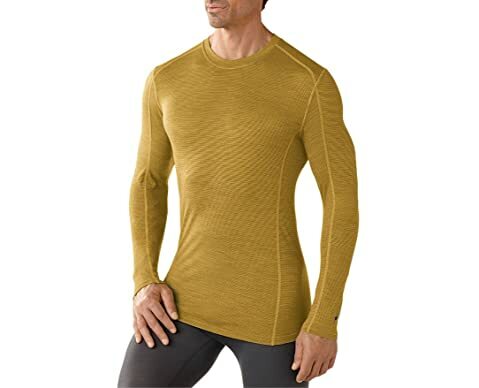 The SmartWool Men’s NTS Micro 150 Pattern Crew Neck is another excellent climbing shirt loves by the professional climbers all over the world. The shirt is made of complete Merino wool that makes it highly useful for outdoor. It is breathable, lightweight and comfortable. You will feel like you are not wearing anything. Yes, it is that much light. It will let you move in full freedom and support you in all weather condition. The shirt is machine washable. It looks incredible and also ensures proper fit. The color is attractive as well. 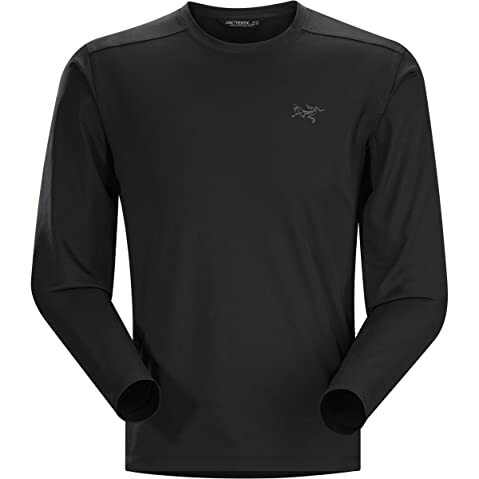 The SmartWool Crew Neck shirt is considered one of the practical options for any outdoor adventure. The Mountain Hardwear Men’s Microchill Lite Zip T is here to make your adventure outstanding with its excellent class. It is also made of superior quality polyester materials that make it breathable and lightweight. On top of that, it dries quickly. So, it is without any doubt an ideal option for outdoor adventures like hiking and climbing. It will keep you warm in cold weather condition. The design is modern with zipper closure. The button closure is good enough, but those are time-consuming. It is machine washable as well. The high cut collar with 12-inch zip for thermoregulation is the smartest addition in this shirt. You will also get two different color options. Overall, the quality is excellent for climbing. It can withstand any weather condition. I am sure you love it. Just give it a try. 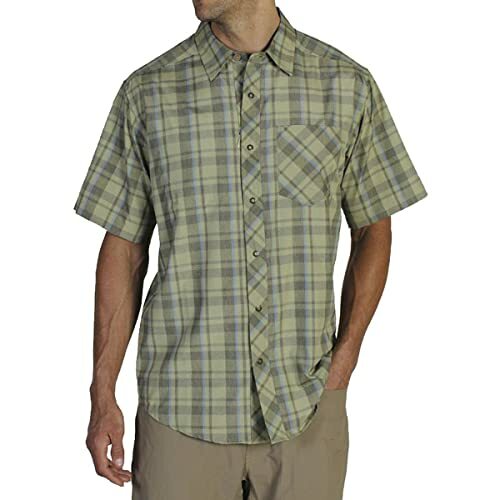 The Nonwe Men’s Hiking Camping Shirt will surely make your journey memorable. It is made with excellent quality Chinlon and Spandex materials. The craftsmanship is outstanding as well. So, it is without any doubt a long lasting option. It is a roll-up design long sleeve shirt that looks great. You will never feel anything while wearing those shirts. Those are lightweight and breathable also ensures an excellent fit. Those shirts are machine washable; you can also wash them with your hands. But never use bleach. The shirt also has two Velcro pockets on the chest. The design is attractive. The price is acceptable for the quality. 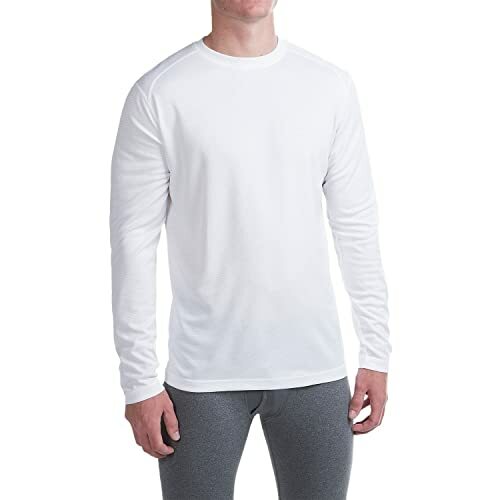 The Terramar Men’s Helix Mountain Long Sleeve Tee is made of complete micro polyester material. As we all know, polyester material is light, breathable and absorbent, so, you can realize how good this shirt is! It is thin and comfortable. The shirt looks great with excellent full sleeve design. It fits properly. Good news is, you will get a wide variety of colors to choose. It is shrink resistant, moisture wicking and retains in shapes quickly. The price of the product is reasonable as well. The Unitop Men’s Hiking Shirt is made of Chinlon and Spandex materials. It is another most practically designed hiking and climbing shirt of the present time. It is highly prevalent in the climbing universe due to excellent craftsmanship with quality materials. The shirt is designed to last. It has several color options to choose from. You will get two security Velcro chest pocket for keeping important things. The long sleeve design is highly useful to use in any weather condition as you can roll it up according to your need. The shirt dries quickly. It is wrinkle resistant, lightweight and breathable. It is ideal for all the outdoor adventure like hiking, climbing, traveling, camping, mountaineering, fishing and many more. You can use it in spring, summer or autumn. The price is not high. Give it a try before the stock expires. 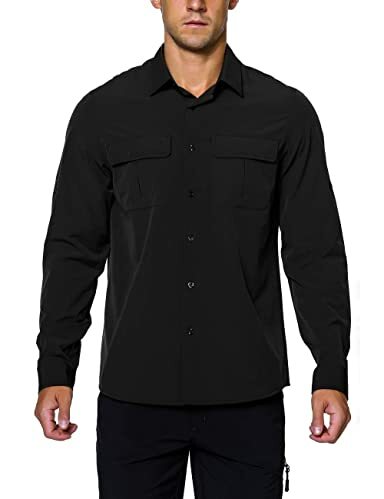 ExOfficio M Trip’r Short Sleeve Jacket is another outstanding option for the price. It looks great and works great out there on the adventure spot. The jacket is made of premium quality material that ensures its durability. The design is pretty attractive. It can withstand any weather condition. Summer, winter, autumn is not a problem. The shirt has a snap front closure design that makes it quick to wear and remove. Cleaning is not a problem. The shirt is lightweight so you will get full freedom of movement. You will also get vertical security zip chest pocket, shoulder yoke, locker loop and floating pocket loop. The shirt is comfortable to wear. The price is reasonable as well. At last, we have the Arc’teryx Men’s Iridine Crew LS climbing Shirt. It is another great option for regular climbers. The shirt is made of a premium quality polyester. So, it is long lasting, breathable and lightweight. While wearing this shirt, you will feel nothing but the ultimate comfort. The shirt is durable and also quick drying that makes it one of the most elegant options for outdoor use. The smart contrast ringer collar reduces collar chafing as well. The shirt will give you sun protection. It is comfortable to wear and clean. The price of the product is not prohibitive. That’s all for the best climbing shirt reviews. I am sure you already selected one from the above list. All of them, made of high-quality materials, provides ultimate comfort while climbing. The price is not high as well. Choose according to your Type of Climbing: Choosing the right climbing shirt or shirts depend on the climbing type. For sports climbing or bouldering, your style preference will do. For trad climbing, a long sleeve shirt that can protect your skin from rock abrasion is preferable. If you want to head up a big wall, climbing shirt with several layers is ideal. Besides, you have to know the weather correctly. Be prepared for rapid weather change in desert and mountains and pick according to that. Flexibility is a must from a climbing shirt. It provides freedom of movement. Climbing clothes usually come with lots of layers and shield to protect different weather condition. Those extra layers and shield often made climbing shirts less flexible. Don’t pick anything that is less flexible. It will make everything complicated. Material is another crucial factor to consider. The most popular material for the climbing shirt is cotton due to its durability against an abrasive rock. They are soft and gentle on the skin too. However, blends are also good instead of cotton only. You can go for cotton-polyester or cotton-spandex for better durability. Merino Wool and synthetic fabrics are also getting popular nowadays. When it comes to color, the preference is yours depending on your choice. Every individual is different so as their choice. Fortunately, you will see a wide variety of colors while shopping for climbing shirts. Pick one you love. Price is an issue for everyone. We all have a budget limit, and we don’t want to cross our budget limit. Luckily, the amount of the best quality climbing shirts isn’t that high. I am sure you will surely get one according to your need. Still, you should know that you will get what you pay for. If you need the best quality, you have to spend a bit more. With the support of better clothing and equipment, your climbing journey will be more enjoyable. As climbing shirt is one of the must-have apparel, so we reviewed some of the best climbing shirts of the present time. I hope you already selected one from the above list. We also told you some essential buying tips. Now it’s your choice. Either you can pick one of the best from the above list, or you can consider otherwise. Just make sure you are spending your money wisely. If you have anything else to know, feel free to comment.